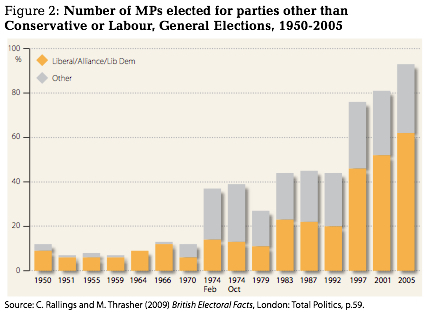 Even without the Lib Dems' surge, hung parliaments are the shape of things to come. Dr Stuart Wilks-Heeg from the University of Liverpool explains why. Given the widespread consensus that Nick Clegg won the spoils in the UK’s first ever televised party leaders debate, we can now expect to witness the Lib Dem leader to be asked even more repeatedly by journalists what his party would do in the event that neither Labour nor the Conservatives secure an overall majority. One oddity about this line of questioning is that the issue is being raised with the wrong party leader. It is actually Gordon Brown who should be asked about his intentions in the event of no party securing an overall majority, particularly now that we know just how keen he is to find ways to “agree with Nick” on a whole range of issues. The reason why Mr Brown’s intentions matter most is very simple. Should the Conservatives fail to win a majority of the seats in the Commons, all initiative will rest with him. We know this because, according to the Cabinet Office guidance released in February this year, the basic principle governing the contingency of a hung Parliament is that, initially, the incumbent remains in office. It does not matter whether another party has won more votes or seats, or both; Gordon Brown is entitled to remain Prime Minister until it becomes clear that he can no longer command the confidence of the House of Commons. Rather helpfully, it seems that Gordon Brown would have up to 18 days in which to establish workable arrangements in the Commons. “the person who appears to be most likely to command the confidence of the House of Commons will be asked by the Monarch to form a government”. Since there is no direct suggestion that this person should be the leader of the largest opposition party, it is perfectly possible that another senior Labour figure could then be approached, for instance Harriet Harman, as the previous Leader of the House of Commons. Inevitably, in the absence of a fully codified constitution, there are ground to dispute the validity of these principles. It is hard to find any constitutional precedent for the suggestion that, should Gordon Brown be able to secure sufficient Commons support, David Cameron would not automatically be appointed Prime Minister. We can also question the implicit assumption made in the guidance that February 1974 provides the constitutional precedent for all ‘hung Parliament’ scenarios. As with any indecisive election, the February 1974 produced a specific type of ‘hung Parliament’ – one in which the opposition won the largest number of seats, although the incumbent Government secured fractionally more votes. A number of other ‘balance of power’ scenarios are also imaginable, several of which have previously come to pass, and could be argued to offer the basis for alternative constitutional precedents. But it is not just that there are some quite seriously conflicting constitutional interpretations. An equally profound issue is raised by the manner in which the vicissitudes of the UK’s constitutional arrangements interact with the vagaries of our electoral system. Imagine the following outcome after 6 May. The election sees the Conservatives win 33 per cent of the votes, the Liberal Democrats 30 per cent and Labour 28 per cent – as predicted in the YouGov poll reported in yesterday’s Sun. The Conservatives have the most votes, but are 82 seats short of a majority, while Labour is the largest party, falling 52 short of a majority, despite coming third on vote share. Gordon Brown remains in office, and manages to secure the provisional support of MPs from the SNP, Plaid Cymru, and SDLP while the Lib Dems refuse to back Cameron because of his opposition to electoral reform. A minority Labour government takes office with a little over a quarter of the vote, despite the Conservatives securing the larger share of the vote. The government manage to win the vote on the Queen’s speech by promising substantial extra ‘ring-fenced’ funding to Scotland, Wales and Northern Ireland. While this is a purely hypothetical scenario, the point is that such a situation could quite realistically occur because of the fundamental mismatch between our current constitutional arrangements and an emerging multi-party system operating within the confines of a non-proportional ‘first-past-the-post’ electoral system. Whether the moment of constitutional and democratic crisis emerges in 2010 or not, we can certainly expect it to arise within the next decade. With both of the main two parties likely to continue to poll less than 40 per cent for the foreseeable future, single party majority governments in the UK are becoming ever less likely; should they arise, in 2010 or beyond, their lack of democratic legitimacy will become all too apparent. • Democratic Audit’s briefing paper, “Governing without majorities: coming to terms with balanced Parliaments in UK politics”, can be downloaded here. It would be a catastrophe for both this country and its democracy if Brown managed to cling on to power with the most seats despite finishing with the second of even third largest share of the vote. The public will have voted to remove him as leader and for him to remain as so would be a terrible slap in the face – one I think would invoke a real crisis. We don’t vote to ‘remove PMs’; we vote to elect MPs from parties whose policies we support. The PM is then whoever can form a government from the resulting parliament – this is perfectly normal and common to most western democracies. All this focus on the ‘PM as President’ is an illusion of an America-obsessed media and political culture that ignores the realities of our system. Fascinating @leftfootforward piece on the scenarios for a hung parliament http://is.gd/bTVif Time for a written const., elect reform surely? RT @jonworth: Fascinating @leftfootforward piece on the scenarios for a hung parliament http://is.gd/bTVif Time for a written const., elect reform surely? Argh, Stuart Wilks-Heeg suggests Harriet Harman could be invited to form the next government http://bit.ly/9HLdIW that'd be interesting!